Since returning to HeartCry three years ago, I have been eager to visit Malawi and see the work of our faithful missionary pastor, Malamulo Chindongo. For the sake of transparency, I suppose I should admit that my interest was further fueled by the legendary beauty of that little nation. Earlier this year, that longing was finally fulfilled. With joy, I can sincerely testify that the natural beauty of Malawi and the health of Mala’s church surpassed all my hopes. Antioch Baptist Church in Blantyre has been in existence for several years now, and it was exciting to see firsthand the level of maturity that they have attained. Antioch has about 50 members and an average of 80 attending Sunday morning worship. Some of the earliest members were university students who are now graduated, employed, married, and raising families. This in turn is slowly helping the stability and financial strength of the church. It was greatly encouraging to see the depth of their doctrine and the warmth of their worship. Mala is a truly gifted expositor, and the sermon I heard was both Christ-exalting and practically helpful to the hearers. Antioch’s love for God and His word is matched by their concern for the lost. 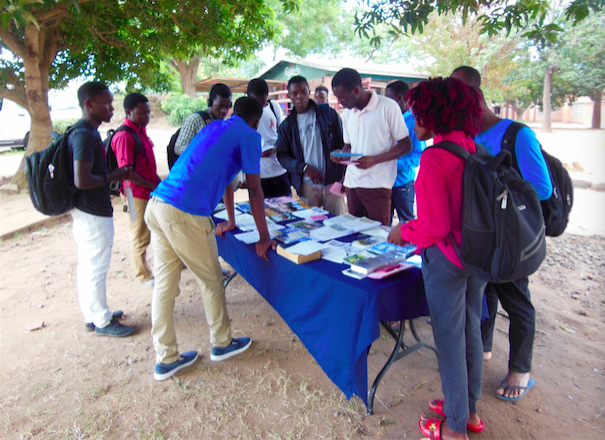 My Saturday morning with them was filled with evangelistic activities on the university campuses (such as the book table below left), and my Saturday afternoon was spent preaching a half-day seminar on church planting. This is a church truly looking beyond themselves to the immense spiritual need across their nation. University ministry is definitely one of the strengths of Antioch Baptist. 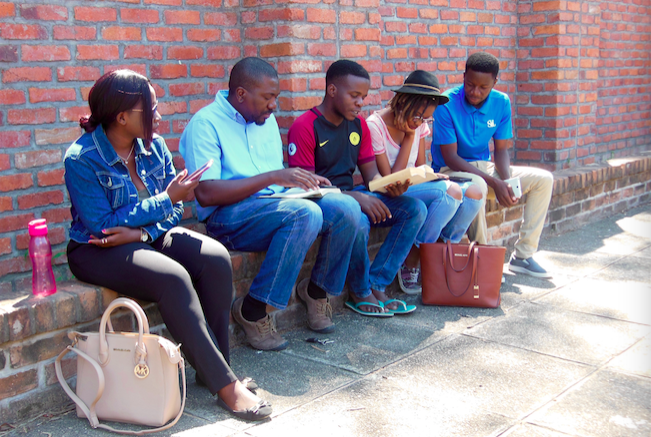 They are holding both evangelistic and discipleship Bible studies on multiple university campuses in their area (such as the one below right), and they have seen many students converted over the years. In Malawi and other African countries, there is a bittersweet aspect to this ministry. Churches in these ‘university towns’ often lead students to faith in Christ and start them on the path to spiritual maturity, only to give them away as they move to bigger cities seeking employment. Among the pastors we work with in ‘university towns,’ I detect no reservation as they devote their time and energy to these students. They are true shepherds who love the sheep their Lord has entrusted to them. These pastors also observe a steadily increasing by-product of their ministry among students. The students who are converted come to cherish healthy churches that are biblical in their teaching and practice. When they graduate and move to the ‘big city’ for work, it is often nearly impossible to find such churches. These students stay in touch with one another and with their first church. They persistently plead for a biblical church to be established in their city. In a very real sense, pastors like Mala see themselves nurturing the seeds of future churches that the Lord is spreading across their land. In fact, I met a brother named Kondi in the capital city of Lilongwe. Kondi was trained in a seminary associated with Masters Seminary. One day Kondi was out evangelizing and ran across a group of young men discussing the Puritans and the unbiblical practices of most churches in their city. It turned out that these young men were former students from Mala’s church in Blantyre! Kondi began meeting regularly with them, and the seed of another church has taken root and begun to sprout. Kondi was part of another very pleasant surprise waiting for me in Malawi. 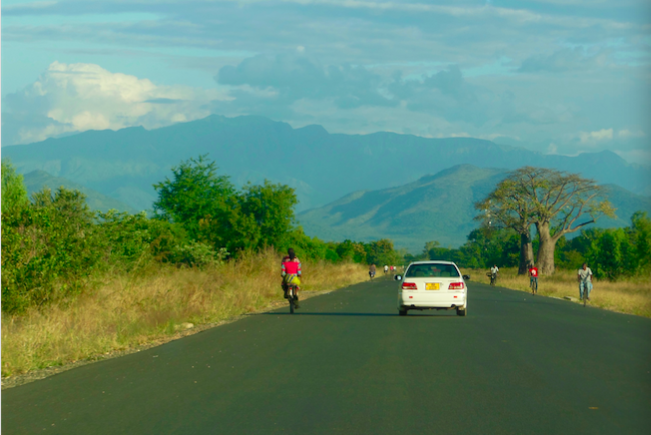 Before my trip, I knew very little about the broader gospel and church-planting work in Malawi. I really did not know if much of anything existed beyond Blantyre. Mala and his wife, Rachel, met me at the airport in Lilongwe and immediately took me to an impromptu meeting. 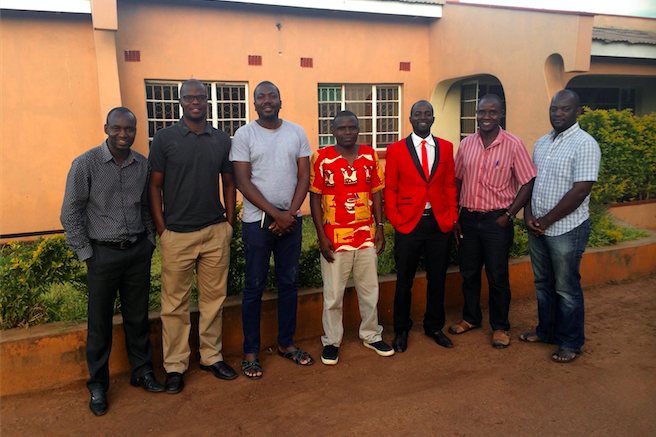 There I was overjoyed to meet several pastors with solid doctrine who are busy planting churches in Malawi (left). These men are steadily growing in their communication and cooperation with one another. 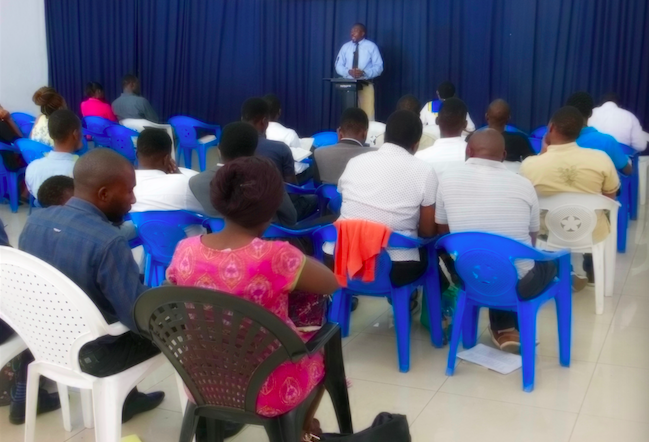 The future looks much brighter for biblical church-planting in Malawi! Please pray for Mala and Antioch Baptist as they continue moving forward in maturity. Please pray for wisdom as we seek, through them, to expand our partnership with Gospel-laborers in Malawi. Please pray for more faithful laborers and an abundant harvest in this needy field.